Resealing your wine should be easy - and now it is with the CapaBunga Wine Sealer. 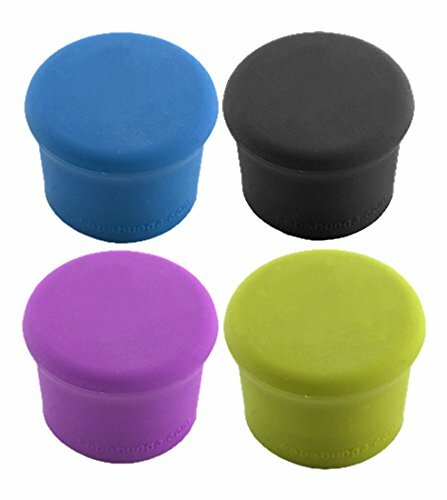 The CapaBunga is a reusable silicone cap that reseals a bottle of wine after you remove the cork. It's made to resemble the bungs used to seal barrels during winemaking. Once you remove the cork and re-seal the bottle with a CapaBunga, it is liquid tight and the bottle can rest on its side or even upside down without leaking. No more jamming the cork back in the bottle, no more rearranging the fridge to fit an open bottle in the door. The open bottle can be stored on its side in the fridge or on a wine rack. CapaBunga fits virtually every wine bottle. Set includes 4 CapaBunga wine sealers with a different design on each cap. Made of 100-percent food grade silicone. If you have any questions about this product by CapaBunga, contact us by completing and submitting the form below. If you are looking for a specif part number, please include it with your message.